All short positions will be covered tomorrow 8/5/11 at the open. RTS will be in cash after open tomorrow. I covered my shorts and sold my index short ETF's today. My LT is in cash now. Indices capitulated today. They closed severely and dangerously over sold. Tomorrow, somehow, someway indices are either back stopped or we'll have a global financial meltdown on our hands. I didn't expect a capitulation anytime soon for reasons stated on my post yesterday. 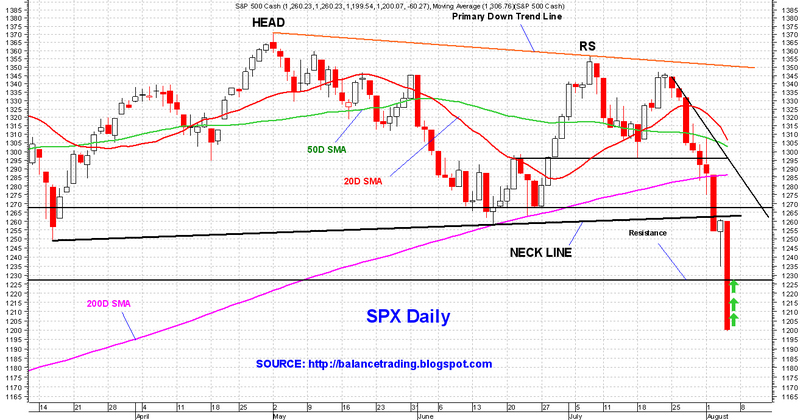 The line in the sand today seemed to be yesterday's low which was also March low for all indices except for RUT. I think Big Money did his best to defend that line. The problem was once a trading desk(s) continued selling beyond that support, all trading desks piled in. It was that herd mentality or possibly trading algorithms that pushed indices down so hard. There is a good probability that we get a vicious short covering rally tomorrow if the employment data is better than expected or if the Fed intervene in some way, perhaps some statement before open if employment data is worse than expected. If such a rally happens, I expect indices to rally around 2.5% intraday. I did warn about this two weeks ago, "Fasten Your Seat Belt, Rough Ride Ahead". The ride is about to get really rough now.